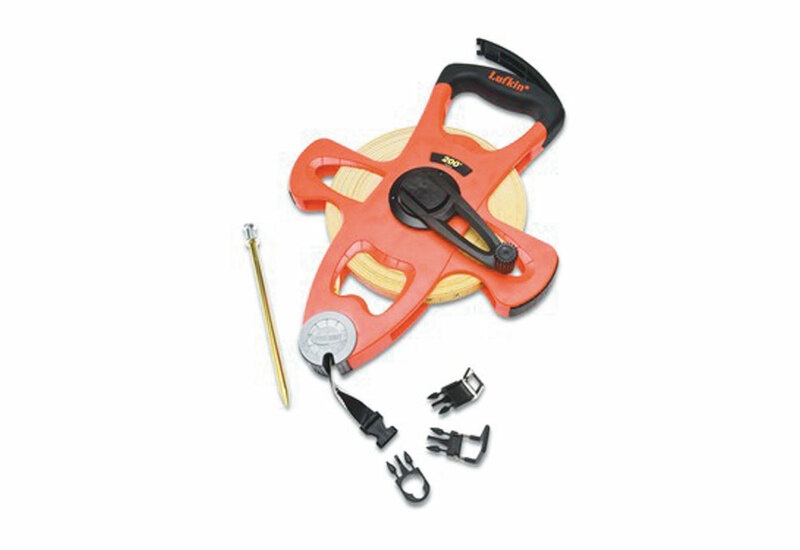 The Lufkin Pro-Series tape measure 3-to-1 rewind for quick blade retraction. The 3/4" blade is more durable, and the articulating mouth interface reduced stress on the blade and moves with the blade reel. The large numbers along the tape are easy to read on the 2-sided blade. On top on the blade, feet and inches are marked, and on the bottom feet to 10ths and 100ths. It's made of 62 fiberglass strands with double-PVC coating for durability, and strengthened with cushion grips on handle and frame arms for comfort. The fiberglass keeps the tape waterproof, which makes it easy to clean and it won't rust. The tape also has an anodized aluminum stake with three rig attachments for one-person measurements. 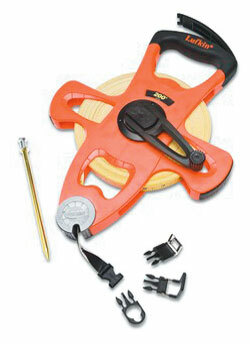 There is a standard folding end hook for general measuring needs, and an appraiser's hook attaches to oversized objects . The rings are stored in the integrated handle and the stake is stowed on the side of the tape. At the end of the tape, there is also a snap-fit lock mechanism for the ring attachments. ENGR : Abbreviation, engineer. This abbreviation is primarily used in product names for efficiency. SRVG: Abbreviation, surveying. The SRVG abbreviation is only used in the product name for efficiency.